The vegan protestors who took to the streets of Melbourne to have their say now face up to five years in prison. Is this a fitting punishment? As a nation, we love nothing more than our freedom of speech, and defending our right to wield it. Whatever it is, whatever view we hold, we believe that we should be able to voice it and be free of punishment. Bill Leak, Pauline Hanson, our Universities, it doesn’t matter. 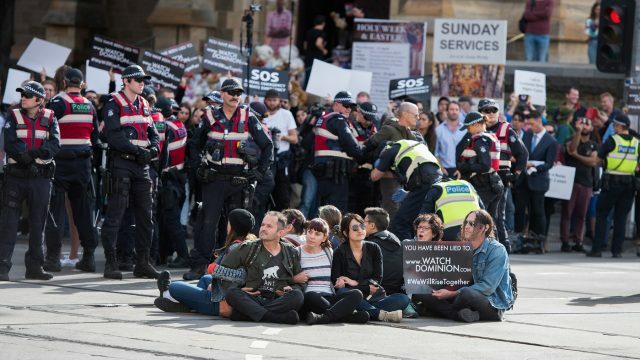 Yesterday, animal rights protestors disturbed the flow of traffic in Melbourne (and boosted the traffic of news websites), with the police mobilised to handle the rather inconvenient evoking of their right to free speech. Drawing one point to another, five years is the maximum charge that these protestors face. To be charged with such an offence, the individual must meet six criteria. The complainant was a police officer. The complainant was on duty. The accused knew that the complainant was a police officer, or knew that the complainant was probably a police officer. The accused intended to the complainant. The accused’s actions were without lawful excuse (e.g. self-defence). I don’t want to compare legal apples to oranges, but a possible five-year stint in jail for holding a sign, or what SBS described as “chanting for animal liberation, with some sitting on tram tracks, linking arms as they called for the community to stop eating meat and animal-derived products,” is frankly ridiculous. Again, it’s entirely different, and I’m writing with my gut here, but George Pell got six years prison (and will probably only serve three) for his crimes. To hold these people to the same standard, i.e. in potential time served, is beyond all logic and sense. For my money, we need to wake up to ourselves. Editor’s note: What do you think of the possibility of these protestors facing jail?